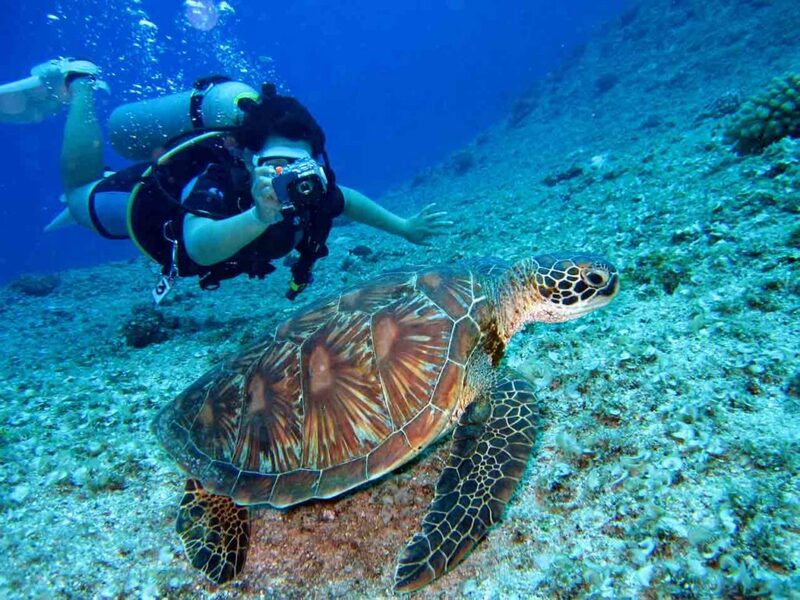 Have you ever wanted to swim with the Turtle in Nusa Penida? Or witness in person the incredible marine biodiversity in the waters of Tulamben? Well now you can! There is nothing stopping you, and scuba diving is truly one of the most rewarding experiences you can ever participate in. Our brains automatically control our breathing. Therefore it can seem intimidating when we have to learn to breathe differently underwater. You can start by doing slow controlled breathing on the surface until you get used to it. If you’re fearful of being in the open ocean, you can start by diving in a pool or shallow waters where you know you’re safe. This is most likely how you will learn to dive with a reputable diving center as well. Sometimes having a friend tag along helps immensely to get over the fear of diving. Knowing that you have a friend diving with you can provide moral and emotional support to keep the fear at bay. Perhaps you’re scared of not being able to communicate or talk underwater? Well rest assured that all divers learn universal hand signals to communicate under the water. Diving with the right instructor can make a big difference to your scuba diving experience. A reputable IDC diver will help not only with the physical diving, but also motivate you to push further in your diving journey. Oftentimes the fear of diving only exists in your mind, and you just need time to let those thoughts dissolve with a bit of rest. While you rest, think about all the different sea creatures that are just waiting underwater for you to discover them. Ask yourself, what motivated you to dive in the first place? Was it the incredible underwater world that you just can’t wait to see? Was it the curiosity of meeting schools of fish, or perhaps swimming with the elusive manta rays? Remind yourself that these marine creatures are out there waiting for you. The certified PADI IDC instructors at Blue Season Bali are ready to guide you on your underwater journey. We have a dedicated team that know the ins and outs of scuba diving for all levels of individuals. Rest assured we’ll make sure your diving experience is in good hands! Reach out to us at Blue Season Bali!